Home > Early Music Vancouver Past Events > The King’s Singers – Royal Blood: Music for Henry VIII -SOLD OUT! To view/download the programme for this concert, including texts and translations, click here. A selection of songs – to be announced during the concert – in The King’s Singers’ signature close-harmony style. Early in his reign as King of England, King Henry VIII oversaw the completion of a beautiful chapel at King’s College in Cambridge; it was a chapel that his grandfather Henry VI had commissioned in 1441, and a building which physically dwarfed everything surrounding it in the busy town of Cambridge. It was the ultimate statement of faith, and its soaring fan-vaulting, elaborate stained glass windows, and flying buttresses all pointed heavenwards. It was part of the University of Cambridge, an institution which had already existed for hundreds of years by the time Henry VIII ascended to the throne, and the great chapel would be an everlasting monument to the piety of the Tudor kings who created it. Today it continues to provide a place of breathtaking beauty and stillness in the heart of the University, and the chapel’s choral tradition, founded by King Henry VI in the fifteenth century still continues to provide beautiful music for the liturgy to this day. One small footnote in the musical history of King’s College Chapel is the founding there of The King’s Singers. Six students who sung in the choir in the 1960s decided to continue singing together after leaving university, and created a new institution which is now in its fifty-first year of touring the world, spreading the joy of a cappella music. The blood of The King’s Singers is itself ‘royal blood’, as the group had its genesis in the surroundings of this great royal chapel. The group’s sound still bears the hallmarks of the chapel’s acoustics, where the founding members learned their trade as choral singers; a trade which has been passed down through generations of King’s Singers. The ‘royal blood’ of today’s programme, however, is that of King Henry VIII and his family. Whilst he helped to build a chapel of unmatched peace and dignity in Cambridge, in other areas of national life Henry was anything but peaceful and dignified — he presided of some of the most troubled times in the history of England. His daughter, Elizabeth, would become another of England’s most iconic monarchs — and under Elizabeth, music and poetry enjoyed a kind of flourishing rarely seen before or since — but even under Elizabeth, all was not straightforward. In particular, the tension between the old Catholicism and the new Protestantism (initiated by Henry’s break with the Catholic Church and the establishment of the Church of England) created extraordinary circumstances in which to create religious art, and a climate of fear amongst those who wished to continue practicing ‘the old faith’. Today’s programme explores some of the words and music to come out of England in the sixteenth- and seventeenth-centuries, through the lens of the Tudor dynasty and the legacy of its most famous King. ‘Pastime with good company’ is a song from 1515 often attributed to King Henry VIII himself. It is now thought to be unlikely that he wrote it himself, but it is possible. It was certainly being sung and played in court during his reign, and would likely have been performed with drums and instruments as a dance. The words mention many of Henry’s known loves — ‘goodly sport’, ‘dalliance’, to pleasure to be found in a ‘hunt, sing and dance’ — and no matter who wrote the song, it gives a real flavour of the sights and sounds of the Tudor court. Henry’s decision to break from the Catholic church and establish the Church of England with the monarch as its head had enormous ramifications, some of which are still visible in the UK today, in the form of (for example) vandalised monasteries and churches whose protestant liturgy and ancient catholic architecture still seem at odds with one another. Yet in the pious and faith-dominated existence of the sixteenth century, the switching from one national religion to another had a far more personal and emotional impact on the King’s subjects than we can easily imagine today. It was a change whose scars could be seen just as clearly decades later, in the reign of Elizabeth I. William Byrd was a composer who led a kind of dual existence: he was one of the Queen’s favoured musicians, and in a feat of pragmatism wrote much beautiful music in English for the Protestant Chapel Royal, including the honorific motet ‘O Lord, make thy servant Elizabeth, our Queen’. Yet Byrd was also a devoted and committed Catholic, whose belief in the doctrine of the Catholic church never left him, despite his working in Protestant circles. As Elizabeth clamped down on illicit, secret recusant Catholic worship, Byrd was forced out of London, to live under the protection of a Catholic landlord. In a large country manor house, Byrd wrote some of his most emotionally charged music, specifically for the Catholic mass services that would take place there in secret. One such work is ‘Ne irascaris, Domine’, where the second part, ‘Civitas sancti tui’, seems to be a hidden message of solidarity for other recusants. The beautiful moment when he sets ‘Sion desolata est’ / ‘Sion is laid waste’ is used as a metaphor for England which, which in the eyes of Byrd, has been taken over by unholy powers and abandoned by God. Despite the severe punishment of Catholics in the latter part of her reign, Elizabeth I enjoyed popularity with much of the English public, as demonstrated in the text of the ‘Choral Dances from Gloriana’, set to music by Benjamin Britten in 1953. This set of four pieces comes as an interlude in Britten’s opera ‘Gloriana’, and focuses on a visit Elizabeth made to the English county of Norfolk on a ‘royal progress’. The villagers are busy preparing to receive her, and in the movement ‘Country Girls’ we hear of flower arrangements being made, ending with the phrase ‘…Norfolk’s own garlands for her Queen’. It was not just village folk who lived in admiration of Elizabeth; in 1601 a large book of madrigals was published called ‘The Triumphs of Oriana’. They were written by many of the leading composers in England at the time, coordinated by the composer Thomas Morley. Queen Elizabeth I was commonly referred to as ‘Oriana’, and this collection is dedicated to her; in fact, every single one of the madrigals ends with the phrase ‘Then sang the shepherds and nymphs of Diana: Long live fair Oriana’. One of the most famous of these madrigals is Thomas Weelkes’ setting ‘As Vesta was from Latmos Hill descending’, conjuring up some of the Greek mythology which so fascinated artists and composers in the sixteenth- and seventeenth century. After Elizabeth I’s death in 1603, James I was crowned as England’s new monarch. James was of the same Tudor blood — his grandmother was the sister of Henry VIII and he had, until this point, been King of Scotland. During James I’s reign as King of England, his son — Henry Prince of Wales — became very popular with the nation, and was expected to succeed James and become king. When, in 1612, Prince Henry died of Typhoid Fever, there was a national outpouring of grief. It is thought that Thomas Tomkins wrote his beautiful lament ‘When David heard’ in response to the death of Prince Henry around this time. If this is the case, then Tomkins uses the biblical childhood death of Absalom and the grief of King David to mirror that of Henry and the grief of the nation. Instead of Henry, James I’s son Charles acceded to the throne, continuing the same family line. Upon the death of Charles, his son James II was crown king in Westminster Abbey in 1685. It was for this grand occasion that Henry Purcell’s anthem ‘I was glad’ — a setting of Psalm 122 — the text of which continues to be sung at all coronations for the British royal family. The final work on the first half of Royal Blood takes us to the more modern sound world of Sir Richard Rodney Bennett, one of the great British classical composers of the late 20th century, who was also a revered jazz musician, and good friend of The King’s Singers. For the group’s 25th anniversary, he wrote settings of words by John Donne, who was Dean of St. Paul’s Cathedral, London, in the early seventeenth century. Donne wrote some of the best known and most beautiful sentences in the English language, and in Rodney Bennett’s setting of ‘The seasons of his mercies’, we hear words from a sermon given by John Donne on Christmas Day 1624. From the pulpit of St. Paul’s, Donne proclaimed ‘In Paradise the fruit was ripe the first minute, and in Heaven in it is always Autumn’, reminding his congregation of the promise of what was to come after earthly life. 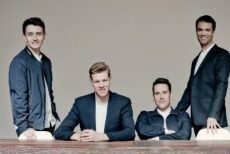 No concert by The King’s Singers is complete without at least a handful of songs ‘in close harmony’ — the arrangements of folk, jazz or pop songs which have become such a signature of the group over its fifty years on tour. The second half of the Royal Blood programme is a chance to explore some of that repertoire. In another nod to the (possible) composition prowess of King Henry VIII, the song which opens the second part is also often attributed to him. In reality, ‘Greensleeves’ is very unlikely to have been written by Henry VIII, but the popular myth goes that it was a song written for his second wife Ann Boleyn, whilst they were courting and she was rebuffing him, or, to quote the song, ‘casting him off discourteously’. This arrangement is by former tenor in The King’s Singers, Bob Chilcott, who has gone on to become one of the leading lights of choral composition in the world today. After a set of English folksongs, all arranged by Gordon Langford — one of the group’s earliest collaborators — there will be ‘The Signature’. This will be a set of songs in close harmony, selected by the group for the audience on the night of the concert, and announced from the stage. There are likely to be some old favourites from the group’s history, as well as a few new surprises to keep people on their toes. from King’s College, Cambridge, gave a concert at the Queen Elizabeth Hall on the Southbank in London. craft and musical diversity is among their most cherished trademarks. without getting lost through a rapid change of line-up. Tavener, György Ligeti, Toru Takemitsu, John Rutter, Luciano Berio, Nico Muhly and Eric Whitacre. collection have been shared with their customers worldwide.